Subtlety. Humility. Melancholy. Slow-paced. 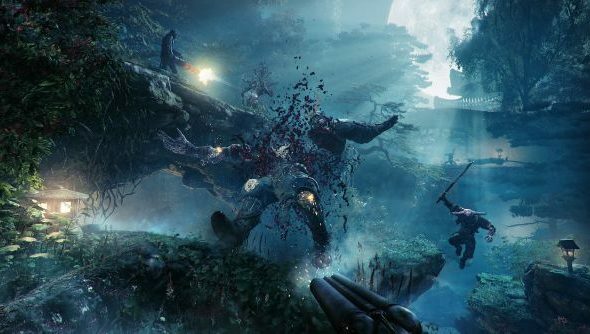 These words mean nothing to the designers of Shadow Warrior 2 or main character Lo Wang. They’re concepts as alien to them as the game’s ersatz-eastern mythology and giant flesh-sack demons are to me. Following the first title’s lead, Mr. Wang spends 90% of his time firing streams of bullets, metal, grenades, rockets and samurai swords into fast-spawning demons, the other tenth being one-liners along the lines of “mess with the bull and you get the wang” – Shakespeare eat your heart out. Discover all this and more in the latest trailer, which is a 15 minute highlight reel of one of the game’s early areas. Just here for the shooty-bangs? Here’s the best FPS on PC. As a man who has regularly enjoyed some of the most bargain basement, meme-laden humour you ever will see, Shadow Warrior’s particular style still manages to grate with me. It’s not important, but every line of dialogue seems to scrape along my nerves. However, you can’t argue with the action or spectacle. It doesn’t quite hit the highs of a Bulletstorm or where the new Doom seems to be heading, but it is a stunningly pretty game that, assuming it’s taken and improved upon its original incarnation, manages to blend gunplay with sword-wielding in an effective, fun and necessary way. It’s fast, enemies take a beating but aren’t bullet spongy to the point of frustration, weapons are varied, stupid and in-theme with the ridiculousness of the universe. The formula doesn’t always work over extended periods, and I bored of the original fairly quickly, but it’s hard to judge from these videos whether they’ll string the correct combo of arena-combat, exploration and, well, ninja swords together to make it work this time. Even if they don’t, it’s definitely going to fill a niche. More info to come at E3, including a look at co-op, another new area plus more enemies and weapons, natch. Game should be out before the end of the year and you can read more about it at – oh come on – whowantssome.wang.